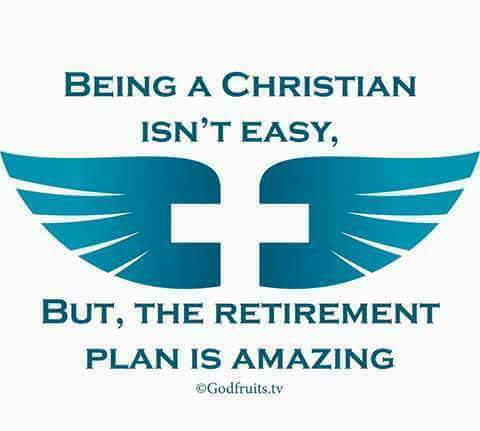 The retirement package consists of ,ETERNAL LIFE; DIVINE LIFE; INCORRUPTIBLE LIFE; INDESTRUCTIBLE LIFE; INSEPERABLE AND UNDEFEATED LIFE. “For God so loved the world that He gave His only begotten Son, that whoever believes in Him should not perish but have everlasting life. For God did not send His Son into the world to condemn the world, but that the world through Him might be saved. “He who believes in Him is not condemned; but he who does not believe is condemned already, because he has not believed in the name of the only begotten Son of God. And this is the condemnation, that the light has come into the world, and men loved darkness rather than light, because their deeds were evil. For everyone practicing evil hates the light and does not come to the light, lest his deeds should be exposed. But he who does the truth comes to the light, that his deeds may be clearly seen, that they have been done in God.”(John 3:16‭-‬21). “Grace and peace be multiplied to you in the knowledge of God and of Jesus our Lord, as His divine power has given to us all things that pertain to life and godliness, through the knowledge of Him who called us by glory and virtue, by which have been given to us exceedingly great and precious promises, that through these you may be partakers of the divine nature, having escaped the corruption that is in the world through lust. But also for this very reason, giving all diligence, add to your faith virtue, to virtue knowledge, to knowledge self-control, to self-control perseverance, to perseverance godliness, to godliness brotherly kindness, and to brotherly kindness love. For if these things are yours and abound, you will be neither barren nor unfruitful in the knowledge of our Lord Jesus Christ. For he who lacks these things is shortsighted, even to blindness, and has forgotten that he was cleansed from his old sins. Therefore, brethren, be even more diligent to make your call and election sure, for if you do these things you will never stumble; for so an entrance will be supplied to you abundantly into the everlasting kingdom of our Lord and Savior Jesus Christ”. (2 Peter 1:2‭-‬11). “Behold, I tell you a mystery: We shall not all sleep, but we shall all be changed— in a moment, in the twinkling of an eye, at the last trumpet. For the trumpet will sound, and the dead will be raised incorruptible, and we shall be changed. For this corruptible must put on incorruption, and this mortal must put on immortality. So when this corruptible has put on incorruption, and this mortal has put on immortality, then shall be brought to pass the saying that is written: “Death is swallowed up in victory.” “O Death, where is your sting? O Hades, where is your victory?” But thanks be to God, who gives us the victory through our Lord Jesus Christ”. (1 Corinthians 15:51‭-‬55‭, ‬57). “Since you have purified your souls in obeying the truth through the Spirit in sincere love of the brethren, love one another fervently with a pure heart, having been born again, not of corruptible seed but incorruptible, through the word of God which lives and abides forever,”(1 Peter 1:22‭-‬23). “The thief does not come except to steal, and to kill, and to destroy. I have come that they may have life, and that they may have it more abundantly”. (John 10:10). “And it is yet far more evident if, in the likeness of Melchizedek, there arises another priest who has come, not according to the law of a fleshly commandment, but according to the power of an endless life. For He testifies: “You are a priest forever According to the order of Melchizedek.” For on the one hand there is an annulling of the former commandment because of its weakness and unprofitableness, for the law made nothing perfect; on the other hand, there is the bringing in of a better hope, through which we draw near to God”. (Hebrews 7:15‭-‬19). “What then shall we say to these things? If God is for us, who can be against us? He who did not spare His own Son, but delivered Him up for us all, how shall He not with Him also freely give us all things? Who shall bring a charge against God’s elect? It is God who justifies. Who is he who condemns? It is Christ who died, and furthermore is also risen, who is even at the right hand of God, who also makes intercession for us. Who shall separate us from the love of Christ? Shall tribulation, or distress, or persecution, or famine, or nakedness, or peril, or sword? As it is written: “For Your sake we are killed all day long; We are accounted as sheep for the slaughter.” Yet in all these things we are more than conquerors through Him who loved us. For I am persuaded that neither death nor life, nor angels nor principalities nor powers, nor things present nor things to come, nor height nor depth, nor any other created thing, shall be able to separate us from the love of God which is in Christ Jesus our Lord”. (Romans 8:31‭-‬39). “But we have this treasure in earthen vessels, that the excellence of the power may be of God and not of us. We are hard-pressed on every side, yet not crushed; we are perplexed, but not in despair; persecuted, but not forsaken; struck down, but not destroyed— always carrying about in the body the dying of the Lord Jesus, that the life of Jesus also may be manifested in our body. For we who live are always delivered to death for Jesus’ sake, that the life of Jesus also may be manifested in our mortal flesh. So then death is working in us, but life in you. And since we have the same spirit of faith, according to what is written, “I believed and therefore I spoke,” we also believe and therefore speak, knowing that He who raised up the Lord Jesus will also raise us up with Jesus, and will present us with you. For all things are for your sakes, that grace, having spread through the many, may cause thanksgiving to abound to the glory of God. Therefore we do not lose heart. Even though our outward man is perishing, yet the inward man is being renewed day by day. For our light affliction, which is but for a moment, is working for us a far more exceeding and eternal weight of glory, while we do not look at the things which are seen, but at the things which are not seen. For the things which are seen are temporary, but the things which are not seen are eternal”. ( 2 Corinthians 4:7‭-‬18). This entry was posted in Daily Message and tagged know your retirement plan.